Adjustable beds are powered devices that give individuals the ability to easily control and change how they are positioned (in bed) as well as their overall comfort level. They are designed with single, dual, or even triple motors that allow the user to elevate and lower both their upper and lower body as desired. In addition to the position of the mattress, there are additional features such as heat and massage that can be added for an even greater user experience. Adjustable beds have become essential tools for use in hospitals, assisted living facilities, rehab centers, and homes throughout the world. Adjustable beds for the home and medical grade, adjustable hospital beds serve two distinct purposes and therefore offer a number of different features. The beds used in hospitals are designed to be sturdy, portable, hygienic, and manufactured in a way so they can be easily cleaned. They are also designed to be used by one person at a time. Adjustable beds used in the home are typically built on a stationary platform that can come in twin, full, queen, and king sizes. Home use beds will also typically have more functionality in the controlling device. When Is an Adjustable Bed the Answer? A medical condition requires it (such as with back problems, neck pain, shoulder problems, osteoarthritis, and even acid reflux – just to name a few). It is becoming difficult to get in and out of a traditional bed. It’s more comfortable to sleep in a partially-inclined position. Additional comfort features, such as heat or massage, are desired. Is my mattress compatible with an adjustable bed? In most cases, if your current bed contains a border wire like the one pictured on the left then your it can’t be used with your new adjustable bed frame. You can typically feel the border wire beneath the layers of your mattress. Most foam and air mattresses are typically always adjustable friendly since they don’t have any pliable layers. Adjustable bed manufacturers typically offer 2 types of motors in their models. AC & DC (alternating current & direct current). The AC variety offers a more powerful and durable motor but also more expensive and louder. A DC motor doesn’t have the power but does offer a few key features including energy efficiency and the ability to add a battery backup. Coil spring beds feature a modified coil spring design that is especially made to be more flexible so it will work with the adjustable frame system. 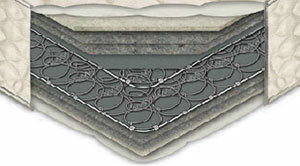 Another good aspect of a coil spring mattress is that they are readily available in a variety of firmness selections. They also have the ability to increase their comfort with the addition of memory foam tops to a base solution that is typically the most affordable. The one major downfall to the coil spring design is that they tend to vary in quality from one design or model to the next. And because there’s no real system in place to ensure conformity, comparing one brand to the next. Heat-sensitive foam mattresses have become quite popular for their therapeutic properties. They utilize the natural body heat of the user and allow the foam to form to the body’s shape and contour. This is great in a variety of conditions because it reduces pressure. And because a standardized system of foam mattress firmness and compression ratings exists throughout the industry, it’s usually simple to compare one heat-sensitive “memory” foam mattress to another. Depending on the specific needs, there are two common types of adjustable bed foam mattresses available. The first is latex-based foam, which tends to be naturally hypo-allergenic; the other type is man-made memory foam. Both types take some getting used to, and they are a bit more expensive than a traditional coil spring mattresses. That said, people who choose foam mattresses rarely decide to switch back to the old fashioned metal springs mattresses. For those who would like the ability to dial in the firmness-level, while still having the option to adjust or change it at any time, adjustable air beds are probably the best solution. This type of bed mattress also provides extra options such as convenient remote control ability, as well as the ability to adjust both sides of the mattress to different firmness settings. It is important to keep in mind that it does take a special type of air bed mattress to work with the bed frame systems. Also, the consumer grade air beds are not as advanced as the type commonly used in health care centers. Choosing an adjustable bed will ultimately come down to choosing the type of bed that is most comfortable for the individual. After all, getting a good night’s rest starts with being comfortable. Isn’t it time you get the relaxing sleep you desrve? GoldenRest adjustable beds offer excellent comfort at affordable prices. We have memory foam mattresses and dual wave massage options. Free shipping and in-home set-up. Find the bed you’re looking for. Call or order online today! 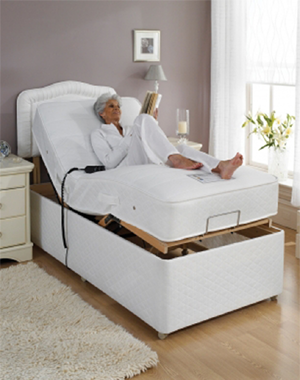 Shop Adjustable Beds and Hospital Beds. Prices start at only $1055 for Adjustable Beds and $465 for Hospital Beds. Free Shipping and Expert Advice! EasyMedOnline.com specializes in Hospital Beds, Adjustable Beds and many more handicap & comfort medical products and accessories. We provide service and in-home set-up all across the United States. Contact us today to speak with an expert. Receive up to 40% discounts and 110% price guarantee. US Medical Supplies carries a full selection Goldenrest adjustable beds in twin, queen, and king sizes. Checkout their website for special offers.